New London is a seaport city and a port of entry on the northeast coast of the United States. It is located at the mouth of the Thames River in New London County, Southeastern Connecticut. For several decades beginning in the early 19th century, New London was one of the world's three busiest whaling ports, along with Nantucket and New Bedford, Massachusetts. The wealth that whaling brought into the city furnished the capital to fund much of the city's present architecture. New London subsequently became home to other shipping and manufacturing industries, but has gradually lost its commercial and industrial heart. 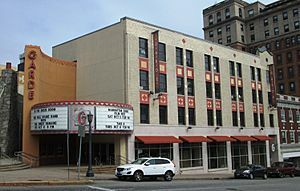 New London is now well known in Connecticut for its wealth of art and popular music scene. 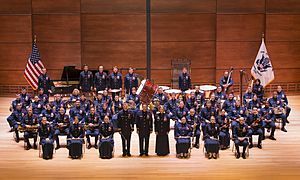 The city is home to the United States Coast Guard Academy, Connecticut College, Mitchell College, and The Williams School. The Coast Guard Station New London and New London Harbor is home port to the U.S. Coast Guard Cutter Chinook and the Coast Guard's tall ship Eagle. 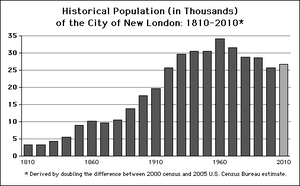 New London had a population of 27,620 at the 2010 census. The Norwich-New London metropolitan area (NECTA) includes twenty-one towns and 274,055 people. The harbor was considered to be the best deep water harbor on Long Island Sound, and consequently New London became a base of American naval operations during the Revolutionary War. Famous New Londoners during the American Revolution include Nathan Hale, William Coit, Richard Douglass, Thomas & Nathaniel Shaw, Gen. Samuel Parsons, printer Timothy Green, and Samuel Seabury. New London was raided and much of it burned to the ground on September 6, 1781 in the Battle of Groton Heights by Norwich native Benedict Arnold in an attempt to destroy the Revolutionary privateer fleet and supplies of goods and naval stores within the city. It is often noted that this raid on New London and Groton was intended to divert General Washington and the French Army under Rochambeau from their march on Yorktown, Virginia. The main defensive fort for New London was Fort Griswold, located across the Thames River in Groton. It was well known to Arnold, who sold its secrets to the British fleet so that they could avoid its artillery fire. 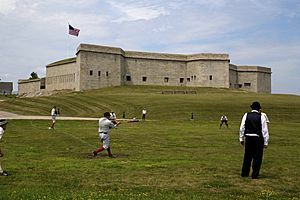 After overrunning New London's Fort Trumbull, Ft. Griswold, commanded by Lieutenant Colonel William Ledyard, was attacked by the British, who suffered great casualties before eventually storming the fort and slaughtering many of the militia who defended it, including Colonel Ledyard. All told, more than 52 British soldiers and 83 militia were killed, and more than 142 British and 39 militia were wounded, many mortally. 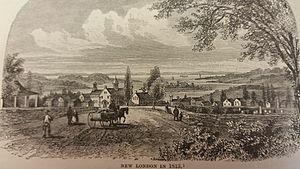 New London suffered over 6 militia killed and 24 wounded, while Arnold and the British and Hessian raiding party suffered an equal amount. During the War of 1812, torpedoes were employed in attempts to destroy British vessels and protect American harbors. In fact, a submarine-deployed torpedo was used in an unsuccessful attempt to destroy HMS Ramillies while in New London's harbor. This prompted British Capt. Hardy to warn the Americans to cease efforts with the use of any "torpedo boat" in this "cruel and unheard-of warfare", or he would "order every house near the shore to be destroyed." The family of Nobel laureate and Pulitzer Prize-winning playwright Eugene O'Neill (1888-1953) were intimately connected to New London. He lived here for years, and was employed as an adult and wrote his first seven or eight plays in the city. 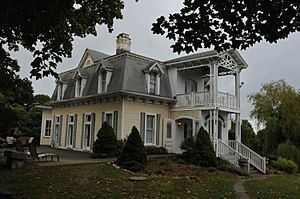 A major O'Neill archive is located at Connecticut College, and a family home in New London is a museum and registered national historic landmark operated by the Eugene O'Neill Theater Center. Dutch's Tavern on Green Street was a favorite watering hole of Eugene O'Neill and still stands today. New London, like the rest of coastal Connecticut, lies in the transition between a humid continental climate (Köppen climate classification: Dfa) and humid subtropical climate (Köppen Cfa), as is typical for much of the Tri-State Area (NY/NJ/CT). The city enjoys a sunny climate, averaging 2,600 hours of sunshine annually, and is the mildest large city in Connecticut in winter. Climate data for Groton–New London Airport (GON) (1981-2010), snow data from Norwich, Connecticut (1981-2010). In the city, the population was spread out with 22.8% under the age of 18, 17.6% from 18 to 24, 29.6% from 25 to 44, 17.9% from 45 to 64, and 12.1% who were 65 years of age or older. The median age was 31 years. For every 100 females there were 95.5 males. For every 100 females age 18 and over, there were 93.8 males. Dawn Robinson, a R&B singer. Fishers Island (7 miles off the coast of New London, but currently part of New York). One of the few remaining houses in the Fort Trumbull neighborhood, June 10, 2007. New London, Connecticut Facts for Kids. Kiddle Encyclopedia.